Line a bread baking tin with baking paper. Combine the flour, cinnamon, natvia and salt in a large mixing bowl and combine. In another bowl, whisk the eggs lightly. Add the milk, bananas and margarine to the eggs and gently combine. Add the liquid mixture to the dry mixture and combine well. Pour the mixture into the baking paper lined tin. Bake for 40-45 minutes, or until golden brown and cooked through. In the last 10 minutes, take the banana bread out of the oven and sprinkle with the chopped almonds then drizzle evenly with the maple syrup before returning to the oven for the remaining time. Serving tip – This is delicious toasted and spread with a natural peanut butter (I use Mayvers). 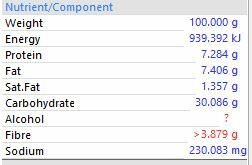 See the below for nutritional data, per 100 grams.